An alternative approach to Materialized view and Query Rewrite is to use Oracle OLAP, which has been an option for Oracle Database Enterprise Edition since Oracle 9i. Oracle OLAP allows you to store your data in a special format inside the database using cubes and dimensions that enables fast analysis and query reporting. But organizations were quickly realizing that the wealth of data in their warehouse enabled much more interesting and sophisticated reports and analysis to be performed. compared to the same quarters last year’. This type of query is often called a multi-dimensional query and business analysts create these queries on-line and ‘slice and dice’ and refine their view of the data to uncover and highlight underlying trends and hence online analytical processing, or OLAP, was born. The multi-dimensional query expresses a business question in terms of the multiple dimensions that describe the data. In our example above, the data is Sales data and the dimensions are Time, Products and Customers (in this case, the geographical location where the customers live in the USA). This type of query can be difficult to express relationally using SQL, but would be simple to describe multi-dimensionally using the Oracle OLAP option. 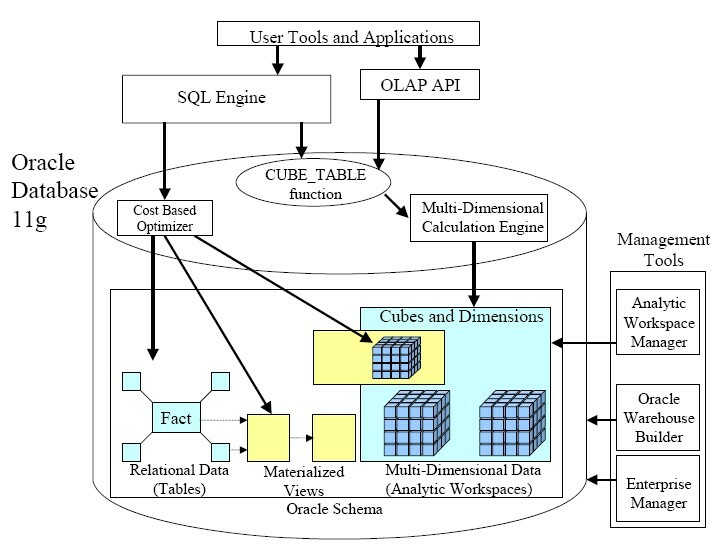 Analytical processing still has to store the data it accesses in a specialized format within the Oracle database and this is an integral part of the Oracle OLAP implementation: data is composed of cubes containing the measures (the data) and whose ‘edges’ are the dimensions that define their levels and hierarchies. 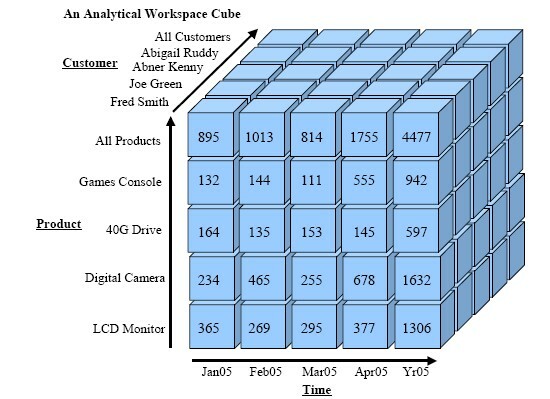 The diagram below shows one cube that is defined by three dimensions, Time, Product and Customer, and the cells within the cube are the data values, (which are also known as measures). In the Figure, the dimensions have been simplified and only depict the lowest levels, for example the months on the Time dimension, but dimensions also incorporate hierarchies that define the grouping of the data. For example, that Months roll up to Quarters that roll up to Years. Within Oracle Database 11g, the OLAP Option provides specialized storage via the analytic workspace and processing for multidimensional data, using the Multidimensional Calculation Engine. The Analytic Workspace (AW) is used to store the multidimensional data types, e.g. the dimensions, measures and cubes. An Oracle database schema can contain one or more analytic workspaces in addition to owning the normal relational objects such as the tables, indexes and materialized views. The Multi-dimensional Calculation Engine provides the calculation functionality that enables the user to create sophisticated analytical queries that execute efficiently. For example, queries that can show trends in the data by comparing results to previous time periods or to other groupings of the data such as product categories or geographic regions. The engine executes the analytical queries but also enables forecast and model trends to be constructed, and to run other “what if” types of examinations that are also commonly performed analytical operations. In addition, there is the SQL interface that enables tools to use regular SQL to query the analytic workspace. The SQL is transformed by the database to operate against the analytic workspace objects and the results returned as rows and columns by the SQL interface back to the SQL query. Finally, there is the OLAP API. This is a programming interface that enables tools and applications to access the analytic workspace and calculation engine directly. Oracle products, such as Oracle Business Intelligence Discoverer 10g and the Excel Spreadsheet Add-In, use the OLAP API to access analytic workspaces. The Figure below illustrates how analytic workspaces sit alongside materialized views and the relational data in Oracle Database 11g and the different tools used for their administration. The cost based optimizer can now rewrite SQL queries to the analytic workspace and materialized views can be defined over the cubes. All metadata for cubes and dimensions is stored in the Oracle database and revealed in the data dictionary views, so that you can query the entire business model in SQL. Use of the data dictionary to store the metadata officially codifies the dimensional model in the database, provides significant improvements for metadata queries, and supports other new features such as SQL object security for cubes and dimensions.